morning, parents and chanichim (campers) streamed into camp. A helpful Kerem (CIT’s) loaded the trucks carrying their plastic shelves and duffel bags and made the day so much smoother. Yesterday during tefillot (prayers) we asked for a morning without rain and, fortunately, the weather stayed sunny, warm, and beautiful for the first half of the day. The Kerem brought everyone’s luggage into the tzrifim (bunks) and, eventually, all of our chanichim had arrived, unpacked, and settled in. It rained on and off as we played name games and icebreakers with the chanichim, but, after a delicious lunch of pizza, made by our new chef, Dave, the sun overcame the clouds and we had an afternoon filled with sunscreen and activities outdoors. 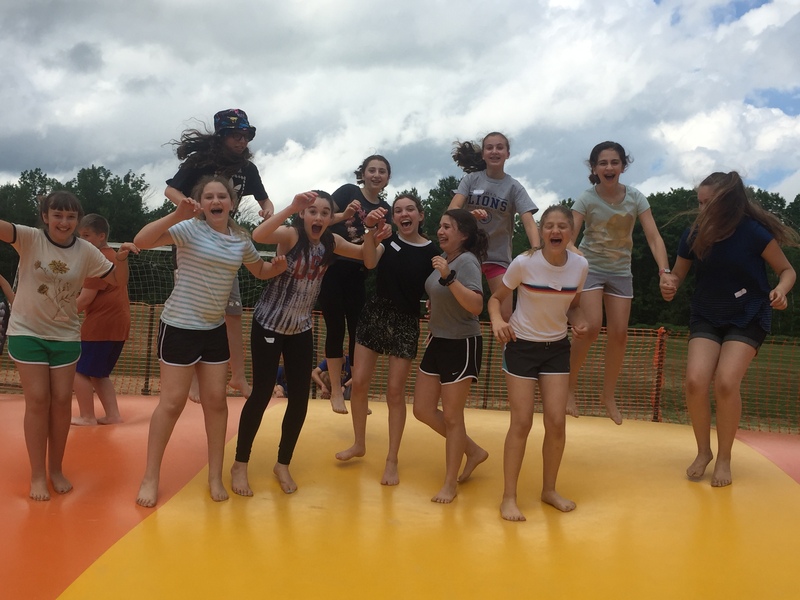 After the banim (boys) played dodgeball on the tennis courts and the banot (girls) played volleyball, the entire ayda came back together to jump on Yavneh’s newest addition, an enormous inflatable trampoline, called the Kangarooach. When it began to rain again, we took cover under a nearby roof and started le arning a cheer that the chadashim (first year counselors) are passing down from their Arayot summer. After shower time and dinner, we had our peulat erev (nighttime activity). The chanichim were divided into groups and had to play travel around to different stations. At each station, after completing the game set by their madrichim (counselors), they were given a puzzle piece. Once all of the pieces were put together, the puzzle read Arayot and had a large painting of a lion on it, representing the unity of the aydah. To end the night, we played a get-to-know-your-madrichim game; the chanichim had to match baby pictures up with the correct madrich. We had a great first day and know that the rest of the summer will be just as amazing!